Push Notifications can be used in most every service in the Server app, especially in 3.5 for Yosemite (which I still like to call Yosemite Server as it makes me think of Yosemite Sam in a tux, pouring champagne). Any service that requires Push Notifications will provide the ability to setup APNS during the configuration of the service. But at this point, I usually just set up Push Notifications when I setup a new server. To enable Push Notifications for services, you’ll first need to have a valid AppleID. 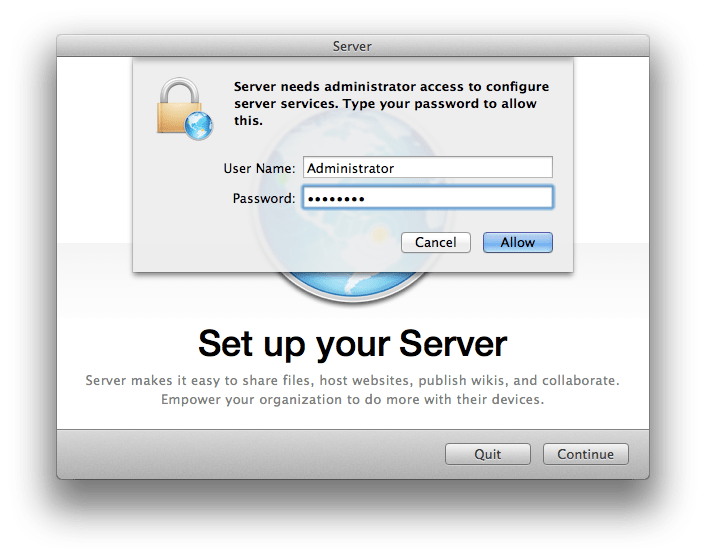 Once you have an AppleID, open the Server app and then click on the name of the server. At the Overview screen, click on Settings. 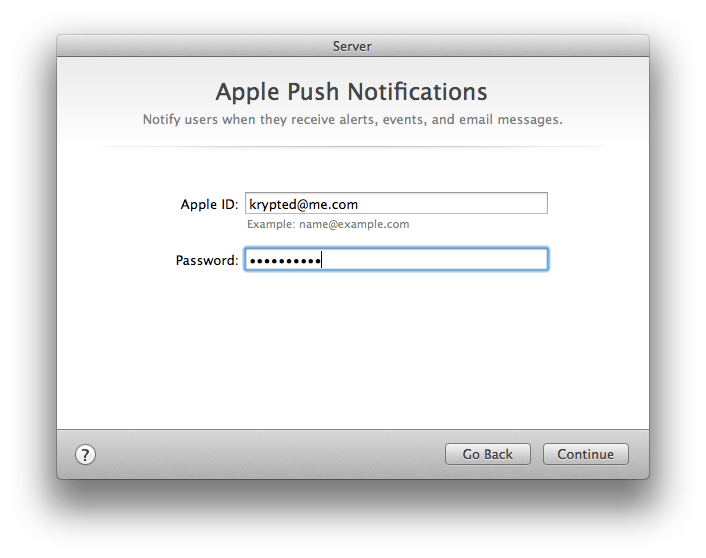 At the Settings screen for your server, click on the check-box for “Enable Apple push notifications.” At the Apple Push Notification Services certificate screen, enter an AppleID if you have not yet configured APNS and click on OK. 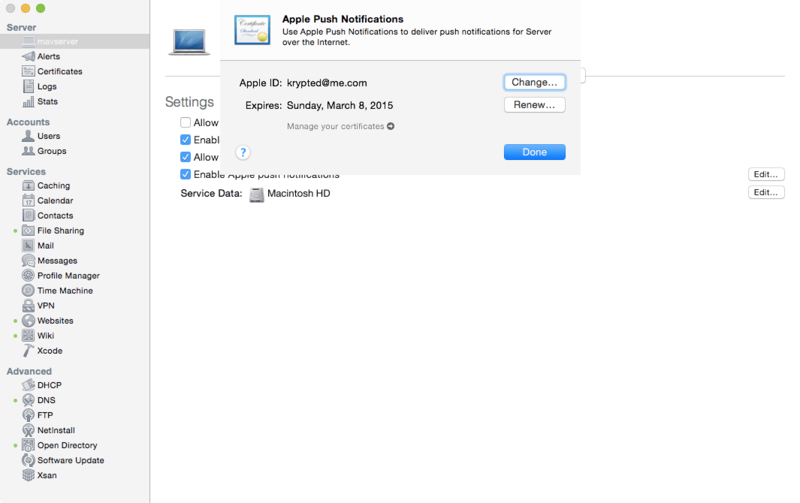 The Apple Push Notification Service certificate will then be configured. The certificate is valid for one year, by default. Administrators receive an alert when the certificate is due to expire. To renew, open the same screen and click on the Renew button. Once downloaded, make sure your users won’t chase after you with pitchforks for being down for a couple of hours and then run the installer, following the defaults until the download begins and the system reboots. The installation will take a little while. From the time you start the download to the time that the files are unpacked and replaced on the system can be about an hour or two. This is a good time to grab that book, a bag of Doritos and a Dr. Pepper. Once the Doritos are gone, wash your hands and check the progress of the installation. Read some more. Once that’s done, check the progress again. If you think about a second bag of Doritos, stop – it’s not worth it… A second Dr. Pepper is fine though, I hear it helps you write articles about upgrading to Mountain Lion Server in a way that makes optimal sense. 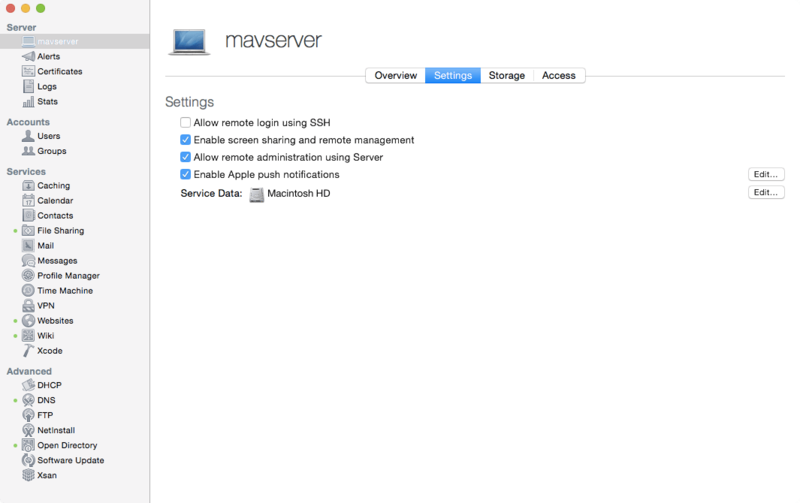 Once the system reboots again, you should be ready to open Server app. Except for the fact that it isn’t there, which is obvious by the fact that it’s got a big annoying white circle over it in the Dock. Remove the Server app (and Workgroup Manager or Server Admin if they’re in there) and then it’s time to install Server itself. 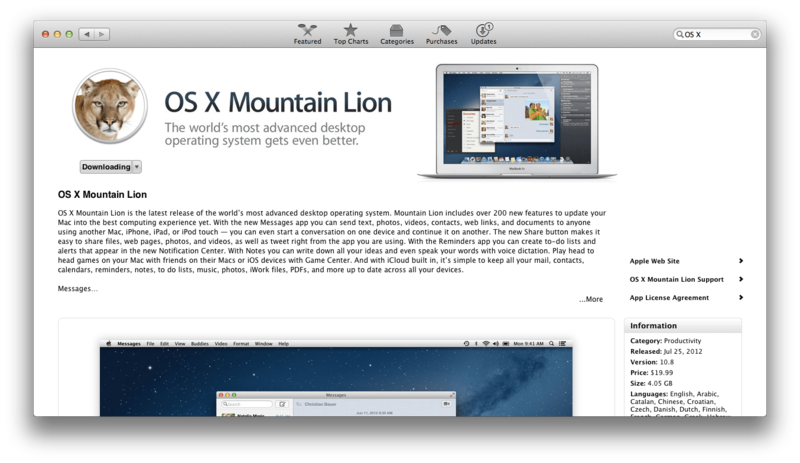 Go back to the App Store and search for & buy Mountain Lion Server (or install these from Purchases if you’ve already purchased them). 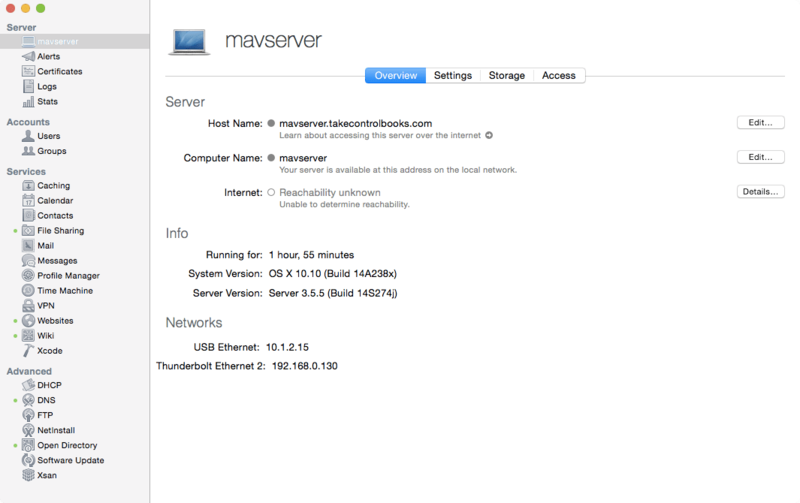 Once installed, Server appears in the Dock. 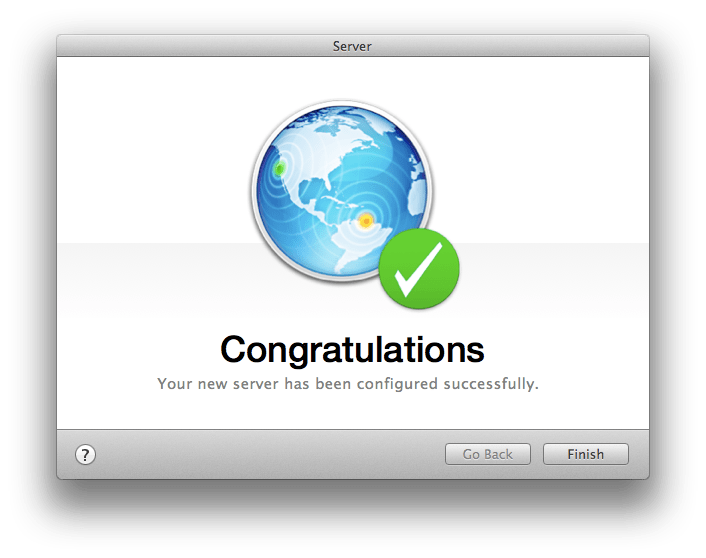 Use the following command to verify that the IP address and hostname match: sudo /Applications/Server.app/Contents/ServerRoot/usr/sbin/changeip -checkhostname Provided that the name of the server checks out clean, click on the Server app in the Dock to be guided through the installation process. 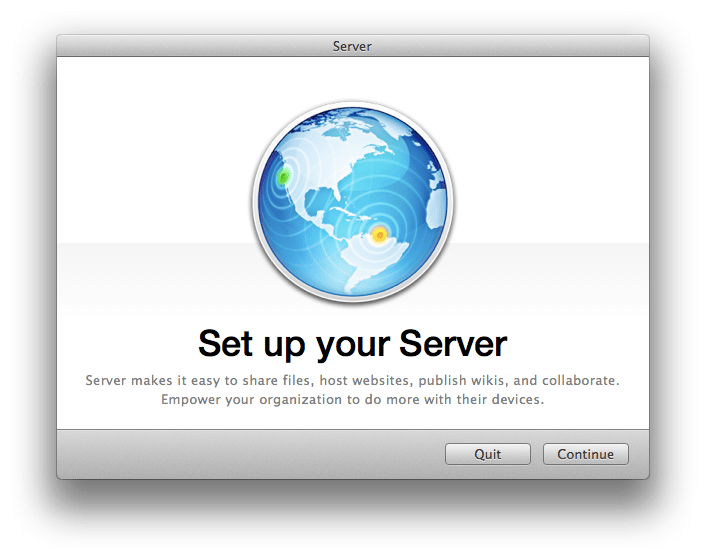 At the Setup Your Server screen, click on Continue. 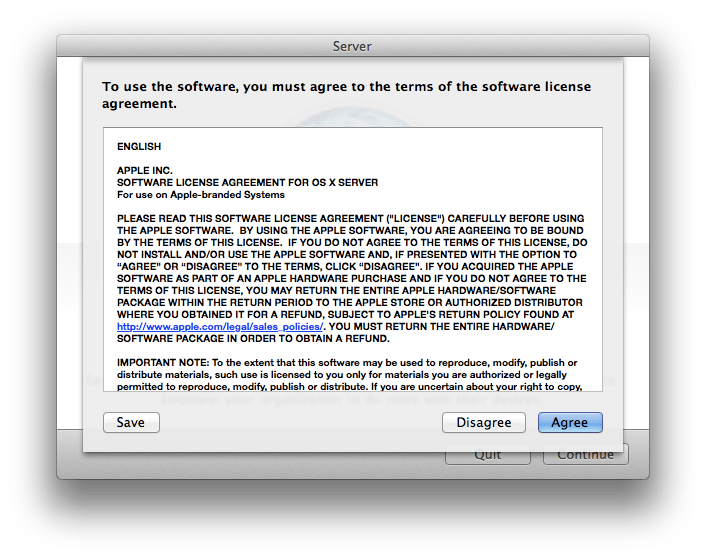 Agree to the licensing terms (assuming you do agree) by clicking on the Agree button. 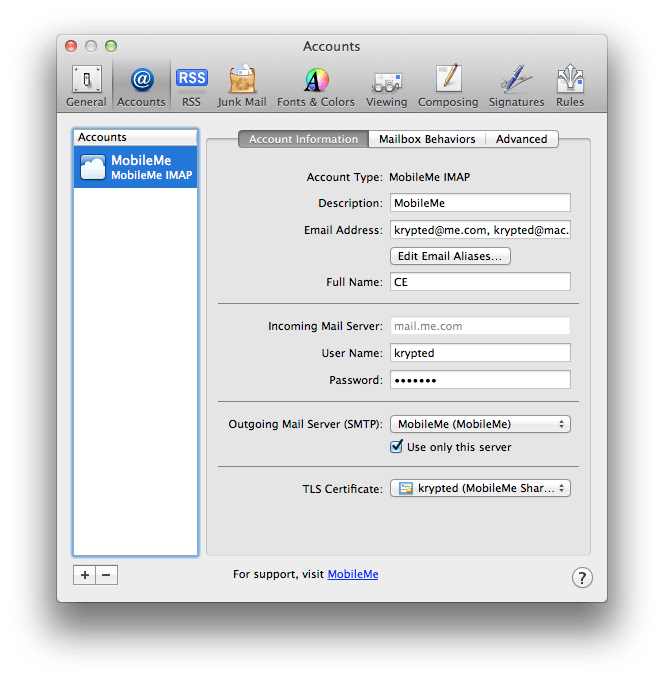 Provide the administrative username and password to give Server and services permission upon installation and then click on the Allow button. At the Apple Push Notifications screen, provide the Apple ID and password for a valid Apple ID and then click on the Continue button. After a time, you should see a Congratulations screen. Click on Finish and the Server app should automatically open (or the process fails but Server opens anyway, just without some of the stuff working out of the gate). 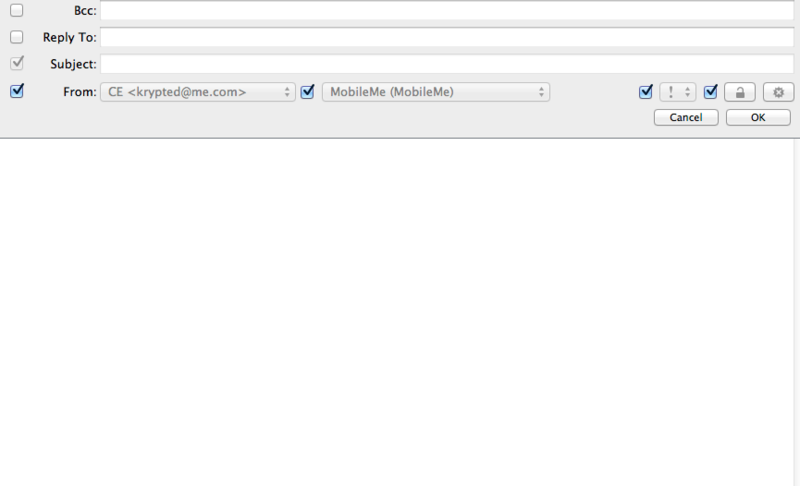 At this point, you should see the services that were running prior to the upgrade running. Check the logs to verify that there’s nothing out of the ordinary. If you were running a firewall then the rules will be migrated and continue running. To disable if you’re going to move your rules to pf, then use the following command to disable the rules and reboot: sudo mv /etc/ipfilter /etc/ipfilter.OLD You don’t need to disable these immediately, although a lack of control over them might cause you to want to… Next, install Workgroup Manager, available at http://support.apple.com/kb/DL1567. You’ve now got a functional server, provided that the entire process went smoothly. In my experience so far (there hasn’t been a ton of this at this point), the service migration is far smoother than from within the Lion Server point releases (e.g. 10.7.2 to 10.7.3, etc). Profile Manager, for example, worked like a charm on upgrade, as did Calendar and Contacts services, which had been a bit persnickety at times previously. Now, you can get back to that book and instead of a 3rd Dr. Pepper, switch to Jägermeister!